Organic Buckwheat Groats are the hulled seeds of the buckwheat plant. These soft white seeds have a mild flavor, but when toasted or roasted, they have a delightfully intense flavor. Groats can be steam-cooked like rice for salads and side dishes or ground in your own mill into fresh flour. Use your freshly ground Buckwheat flour in homemade soba noodles. An excellent source of both soluble and insoluble fiber, each 1/4 cup of Buckwheat also contains 6 grams of protein and 8% of your recommended daily value of iron. Buckwheat provides complete protein. The robust flavor of this quick-cooking gluten free grain is perfect for salads, soups and cereal. Organic Buckwheat Groats also make an excellent hot breakfast porridge or side dish at dinner and can replace rice or any other grain called for in pilafs, casseroles and more. 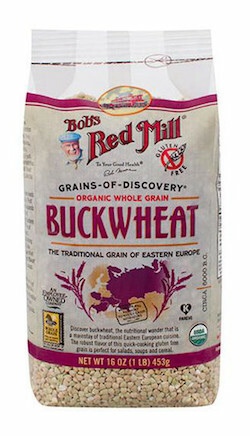 Use buckwheat groats in any recipe that calls for whole grains.